My favorite way to eat zucchini is in chocolate cake, but Zucchini and Pine Nut Fritters come in as my second favorite. The zucchini is grated raw, which preserves the fresh, green flavor. 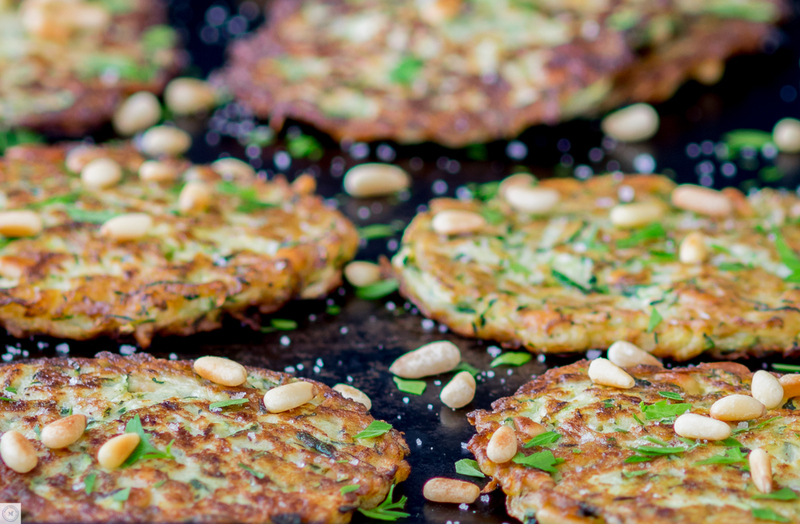 They are a lot like Potato Pancakes but with a softer interior, the fritters get their extra texture from the pine nuts and sprinkle of Fleur de Sel and parsley. In a small frying pan, over medium low heat, lightly toast the pine nuts. Set aside. Grate the zucchini on the largest holes of a grater. Place the grated zucchini on a clean dish towel and squeeze out the liquid. You should have about 2 cups plus of grated zucchini. Put the zucchini in a large bowl, sprinkle with flour, and mix well with a spoon. Add the egg, salt, and the pepper and ¼ cup of the toasted pine nuts. Mix well to form a batter. In a large frying pan, over medium high heat, pour just enough olive oil to coat the bottom of the pan. When the oil is hot, fill ¼ cup measuring cup with the batter and place it in the frying pan about 2 inches apart. With the back of a spatula, press each fritter until it is about ¼-½ inch thick. Cook until the bottoms are golden brown and the edges are set, about 3-4 minutes. Turn with a spatula and cook about 3 minutes longer on the other side. adding additional oil to the pan as needed to prevent sticking. Serve: At once, garnish with fleur de sel, the remaining pine nuts and parsley.